Kyle Rau called it a lucky goal. Bruce Plante isn’t so sure. 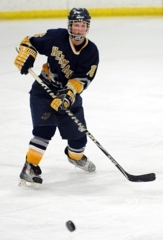 Plante has been coaching at Hermantown for more than 20 years. He’s seen most everything. He’s seen natural-born goal scorers do some amazing things. 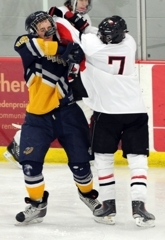 He’s seen enough of Kyle Rau. 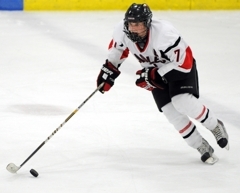 “Guys like him, that happens,” Plante said after Rau scored from the equivalent of a football “Hail Mary” with 5 seconds left in overtime to lift Eden Prairie to a 5-4 victory over Hermantown on Tuesday, Feb. 1, at the Eden Prairie Community Center. The Eagles (14-4-1) are ranked No. 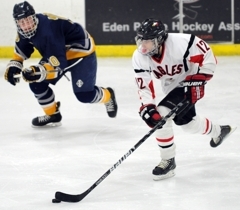 2 in Class 2A while the Hawks (17-2-1) are ranked No. 2 in Class 1A. 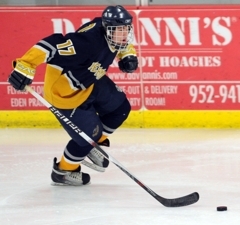 With time running out, Rau raced along the boards into the Hermantown zone. 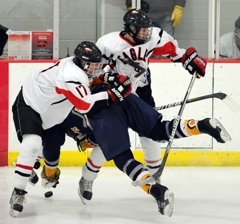 He lost control of the puck for an instant near the face-off circle. By the time Rau regained possession, he was deep in the corner, not far from the goal line. He had just one option. “I threw it on net because we had guys breaking,” Rau said, never expecting that it would go in. 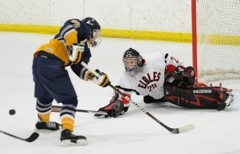 Hermantown goaltender Connor Lucas, a 5-foot-6, 150-pound senior who had been brilliant all game, got a piece of the shot, but the puck dribbled through his legs and slowly rolled over the goal line. 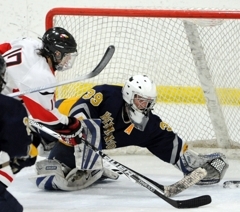 Lucas finished with 49 saves, including 16 in the 8-minute overtime period, when the puck rarely left the Hawks’ end. 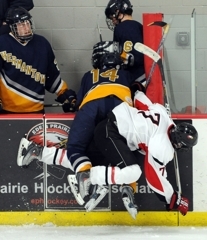 “He was standing on his head,” Rau said. That’s a figure of speech, of course. 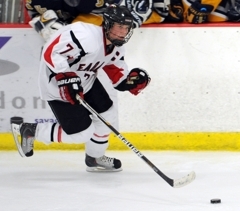 Lucas was standing firmly on his skates most of the night, with the exception of the occasions went Eden Prairie forwards – including Rau -- went barreling into the crease looking for rebounds. 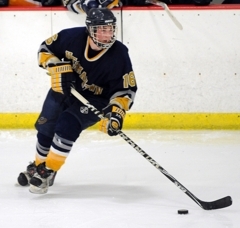 Lucas, despite being the smallest player on the ice, never flinched. 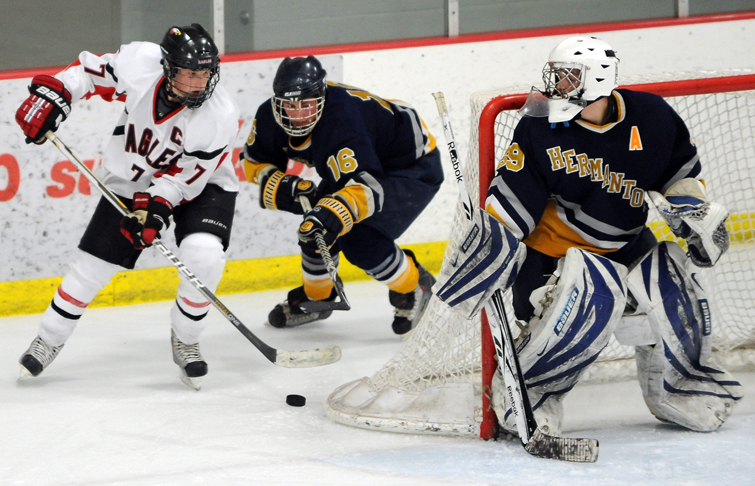 “We didn’t know what we were going to have for goaltending this season because we graduated two seniors,” Plante said.” Connor is just a little guy, so we didn’t know. His margin for error isn’t much. Many of the adjectives that describe Lucas work just as well on Rau. 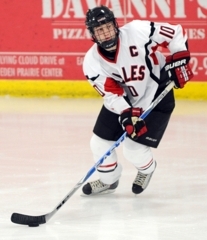 The Eden Prairie sniper, who had three assists to go with his game-ending goal, is generously listed at 5-9, 160 pounds but, like Lucas, plays an oversized game. Rau, whose four-point night moved him into the state’s top 10 in scoring with 52 points, is committed to the University of Minnesota. 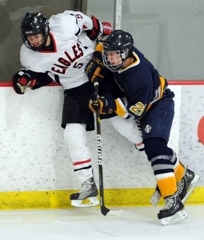 In the meeting between the teams last seasout (outdoors in Hermantown), Rau had a hat trick as the Eagles won 4-3. 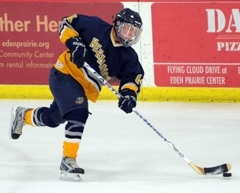 With 48 points in 20 games, including two goals on Tuesday night against Eden Prairie, Hermantown senior Garrett Skrbich has elbowed his way into the discussion for potential candidates for the annual Mr. Hockey award given to the state's best senior. The 6-foot, 190-pound center has scored a team-leading 28 goals and has been held without a point just once this season. 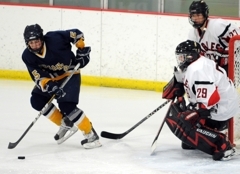 “Skrbich has been a great leader for us,” Hermantown coach Bruce Plante said. “It’s his senior year, and he’s been just awesome. We’re really proud to have him. Against the Eagles, Skrbich centered a line with Jared Thomas and Brian LeBlanc, a defenseman who was filling in at forward for the injured Andrew Mattson. That unit accounted for three of the Hawks four goals, and Skrbich scored twice in the final period as Hermantwon rallied to force overtime. 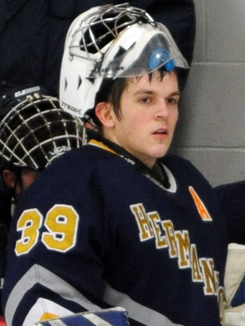 “He’s been leading the team the whole year, on and off the ice,” Hermantown senior goaltender Connor Lucas said about Skrbich, who has led the Hawks to a 17-2-1 record and No. 2 state ranking in Class 1A. 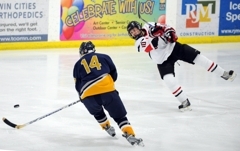 Senior forward Kyle Rau scored with 5 seconds left in overtime to lift Eden Prairie past Hermantown 5-4 on Tuesday, Feb. 1, in a thrilling matchup at the Eden Prairie Community Center featuring the state’s No. 2-ranked teams in Class 2A and Class 1A. 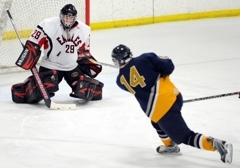 Hermantown, the small-school juggernaugt that finished second at the state Class 1A tournament last March had lost just once this season coming into the matchup, got a goal from senior standout Garrett Skrbich with 2:09 left to force the overtime period. 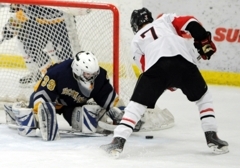 Eden Prairie, the state Class 2A champion two seasons ago, peppered Hawks goaltender Connor Lucas with 17 shots in the 8-minute overtime session as the puck rarely left the Hermantown zone. 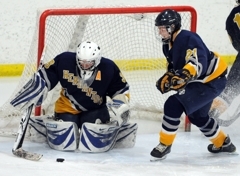 Lucas, a senior, finished with 49 saves. 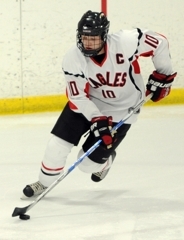 Rau, a frontrunner to win Minnesota’s Mr. Hockey award this season, scored the winning goal on a shot from deep in the corner on a rush down the ice. Lucas appeared to have stopped the shot, but it dribbled between his legs and over the goal line. 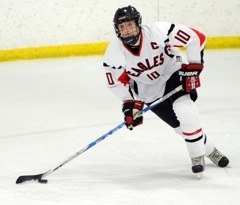 Des Shavlik scored twice and Dan Molenaar added a goal for Eden Prairie (14-4-1). 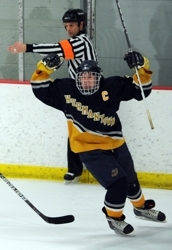 Skrbich finished with two goals for the Hawks (17-2-1), who also got a goals from Jared Thomas and Hazen Elmgren. 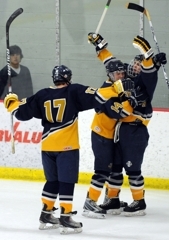 Hermantown scored the only goal of the first period, but then fell behind 2-1 and 3-2 in the second. 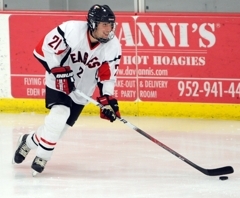 Both of Skrbich’s goals came in the final period, and both tied the score (at 3-3 and 4-4). 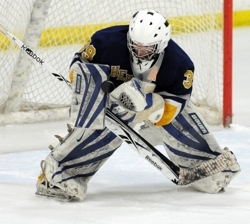 Senior Andrew Ford finished with 24 saves for the Eagles. In a career that has been filled with dramatic goals, Rau added another to his resume with the winner against the Hawks. He also had three assists, drew two penalties, was a machine on face-offs and did his due diligence on defense with some strong backchecking late in the third period and in the overtime. 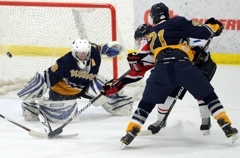 The 5-foot-6, 150-pound senior goaltender faced a mountain of rubber and was at his best in the overtime period, when he made an astounding 16 saves. Lucas’ glove hand was particularly impressive, as he snatched numerous shots ticketed for the upper regions of the net. The big, smooth-skating defenseman scored a power-pay goal and made several end-to-end rushes that resulted in scoring chances. 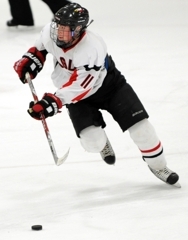 He also played well in the defensive zone, where he was rarely caught out of position.